Close your eyes and think back. I mean way back. Further than that. Keep going. And….stop right there. Do you remember? Your heart is racing with excitement when the two of you made eye contact for the first time. Your legs can’t move fast enough. You fall to your knees, arms out stretched. The weight of impact nearly knocks you right back. Your face…chin, lips, nose, cheeks, ears, eyes… are instantly wet with saliva. Your hands are running through the softest mound of fluff you could imagine. As far as you know, you’re being smothered by a furry cloud. But it isn’t a cloud, and you aren’t being smothered. It’s your very first pet, and you’re being loved. My name is Laura and I work at the Langley Rainforest Learning Centre Daycare. As a child, I had a German Shepard we named Jordan, yours could have been with a kitten or a rabbit or a bird or a fish or even a hamster. No matter the animal the love you felt was the same. The excitement, the curiosity, the joy…it was all the same. At that age the developmental benefits of pet ownership wasn’t even on your radar or the radar of your parents for that matter. You just got a brand new best friend and your parents just acquired a kid who would never move out. Physically, there was no doubt that having a dog got my brothers and I out of the house and away from the TV. Granted, video games weren’t a thing in my house and tablets didn’t exists yet, but there was nothing else we wanted to do more than run around with the dog any and every chance we got. What we didn’t realize was how much exercise we were getting. Good trick mom and dad. Running, jumping, throwing balls, playing tug-o-war. BOOM. Gross motor skills in the bag. Big muscles weren’t the only ones that got worked. Those little muscles that make fine movements got their work out in too. Opening up that big bag of dog food, getting a good grip on the scooper, measuring out the right amount of kibble and balancing the food all the way to the dog bowl goes a long way in fine motor development. Similar exercise to what the kids in our daycare receive, but with of course no pets. As the children get older, helping out with pet grooming also contributes to development of their fine motor skills. Besides raising a perfect athletic specimen, you known, from all of that muscle development, being a pet owner has been linked to health benefits in young children. There is, of course, no definitive proof that there is a link between dog or cat ownership and the popular claim of fewer to no ear infections in children, but this and other proven health benefits have been seen. Dennis Ownby, MD., a Professor of Pediatrics and Head of the Section of Allergy and Immunology at the Medical College of Georgia produced a study demonstrating that pets do indeed reduce a child’s risk of developing some allergies. His research followed 474 children from birth to roughly 7 years old. Ownby’s study found that children with pets were half as likely to have common childhood allergies, had less skin tests come out positive and didn’t develop ragweed and grass allergies as often as children with no pets at home. Even with research the explanation for these results can only be theoretical. “When a child plays with a dog or a cat, the animals usually lick him. That lick transfers bacteria that live in animal’s mouths and the exposure to the bacteria may change the way the child’s immune system responds to other allergens,” theorizes Dr.Ownby. 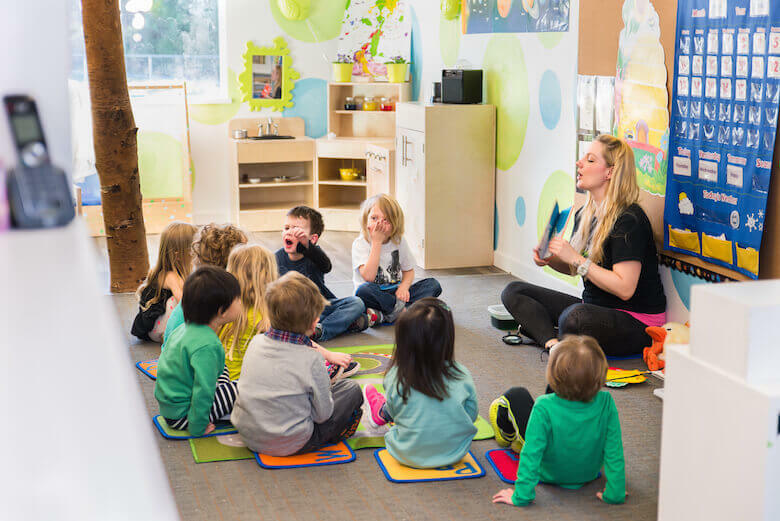 This is a similar concept to where kids that are exposed to germs at a younger age through places like a daycare may be less likely to be as sick as often as adults. This being said, our Langley Daycare and Coquitlam Daycare locations always take preventative measures to minimize any illnesses by keeping our facilities clean. Back to my story… I called my mom while writing this and she said that my younger brother had two ear infections as a child, both before we got our dog. What does it mean? Probably nothing, I’m just giving you the facts. So, if you were on the fence about getting a cat or a dog for the family, could physical benefits or health benefits sway your decision to yes? Probably not. Less face it, you could enroll your child in soccer or even just go for a family walk each day to get in that extra outdoor time. As for health benefits, children put everything in their mouths already, which we witness first hand at the daycare, so your child could just as easily get the bacteria exposure that they need at the playground as the could from a cat or a dog. That brings me to social and emotional development. These two areas complement each other. An emotionally healthy child creates a socially functional one and vice versa. Before entering an environment where social skills are essential and required children can quickly develop non-verbal communication skills, compassion and empathy through time spent with a pet. Animals are unconditionally accepting. The bond that is built between a child and a family pet can be a child’s first peer interaction that models a positive trust filled relationship. This foundation of trust shapes self-esteem, giving children the tools they need to interact socially with others minus inhibition. Every parent does their best to teach their children basic values. Being responsible for a pet can do just that, teach responsibility, but it also teaches respect for life. This and respect for others is also something the children learn in our daycare. Life can be a roller coaster for anyone even a child. Having an every ready pal handy is a gift; a gift that can enhance a child’s natural interest in discovering new things. Encourage your child to learn more about your family pet. Bring them along on vet checkups, the pet store and obedience school. There will be questions so be prepared to answer them or help your child to find the answer. Even if your child requests an unrealistic pet, nurture their interest; use the opportunity to teach them about the library and the internet. You could even use your new family addition to teach new concepts or house rules that your child is having trouble grasping. Maybe your 4 year old still eats whatever they find on the floor, you can teach both your dog and child at the same time by making your 4 year old a pet training partner. You child’s willingness to report the dogs behavior may change their own. There you have it, 4 of the 5 development areas have been affected for the better by having a pet at home; cognitive skills, emotional / social skills and fine motor development. Health benefits, real or otherwise are just the cherry on top. So, how about now?